Figure 1. Reddish-blue translucent nodule on the lower lip. Figure 2. 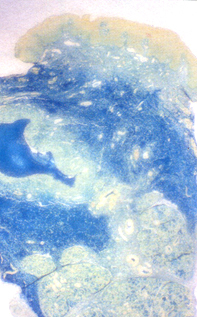 Biopsy showed pools of sialomucin (stained blue) within the tissue. 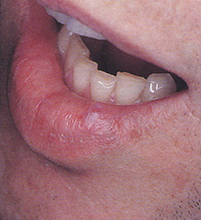 A 28-year-old man noted the sudden appearance of an asymptomatic, reddish-blue, translucent nodule on the left side of his lower lip (Figure 1). A reddish-blue nodule on the lip may represent a number of disorders. The following should be considered in the differential diagnosis. Venous lakes (venous angioma) are often blue-red in colour and are often multiple. They occur more frequently in older individuals and follow a chronic course. The lesions may occasionally be complicated by thrombosis or bleeding. Biopsy reveals large, dilated, thin-walled vascular channels filled with blood. Many of these lesions represent dilated capillaries rather than true venous ectasia. Minor salivary gland tumours or cysts may appear as smooth blue nodules. They may have a sudden onset and be firm to palpation. Skin biopsy shows benign glandular and tubular structures (which may be embedded in myxoid, fibrous or chondroid stroma) or cysts lined by uniform cuboidal cells representing ductal epithelium. Mucocele of the lower lip is the correct diagnosis in this case. Excision biopsy of the nodule revealed large pools of mucin in the mucosal tissue associated with dilated ducts and grouped minor salivary glands in the deeper tissue (Figure 2). The mucocele is caused by the rupture of a minor salivary gland duct, which results in spillage of saliva or sialomucin into the surrounding tissue and the production of a pseudocystic nodule. The nodule is surrounded by inflammatory cells. The process is benign. Alternatively, the nodule may represent a mucus retention cyst due to obstruction of the duct and has a true cystic lining, but these are more frequently localised to the buccal mucosa or soft palate rather than the lip. Superficial mucoceles often spontaneously resolve without treatment. Apart from surgical excision, successful treatment is also possible with cryotherapy, intralesional corticosteroids (triamcinolone acetonide 10 mg/mL) or laser therapy. A translucent reddish-blue nodule on the lip may represent a mucocele produced by the rupture of a minor salivary gland duct and spillage of sialomucin into the tissue. This article was first published in Modern Medicine of Australia in April 1997. It was reviewed and updated in July 2011.